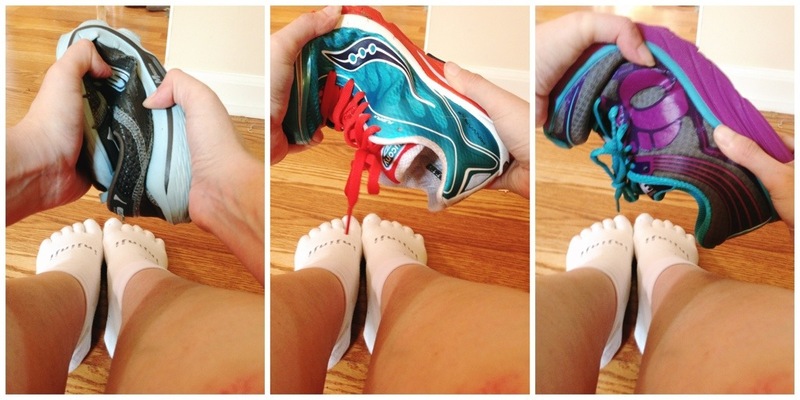 I’ve always been a shoe lover, and that’s no different when it comes to running. 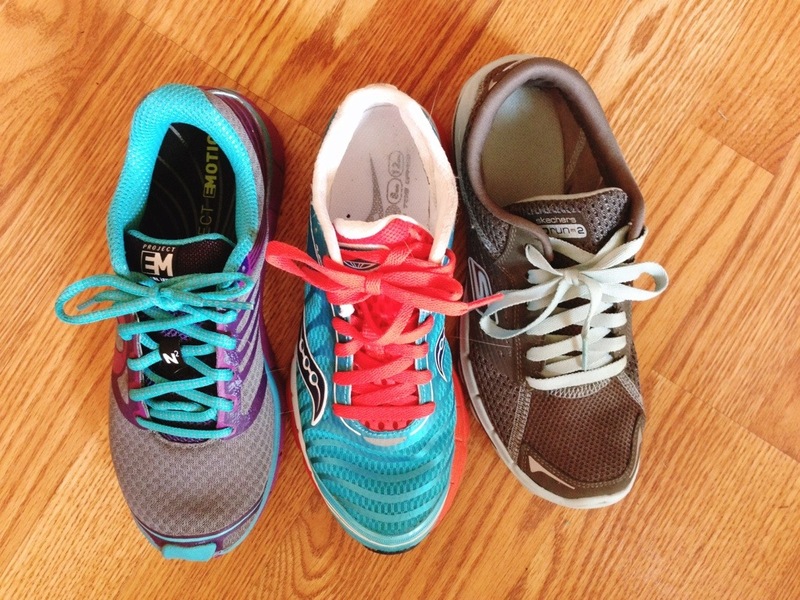 I’ve alluded to the fact that I have multiple pairs of running shoes in several posts, so I thought I’d go over why I have each of them and their pros and cons. Before I really started running, I was wearing some monster Adidas sneakers that I bought my freshman year of college. That’s 13 years ago, by the way. They were clunky, heavy, a half size too big (I swear my feet are shrinking), and did nothing for my running. When I decided to actually become serious about learning to run, my first step was to buy a pair of actual running shoes. These were the first pair I bought, back in February. I’ve put about 150 miles on them since then. I adore these shoes. 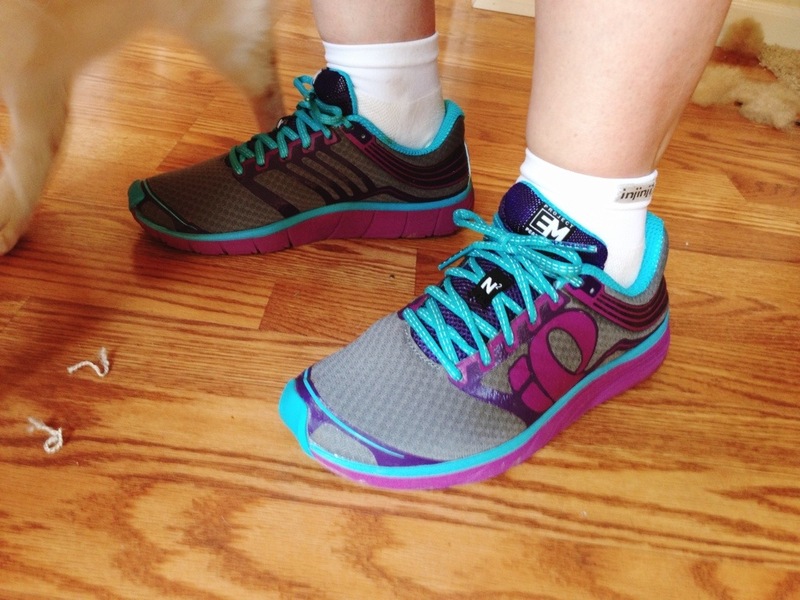 They are lightweight and easy to run in, no matter the distance. I’ve done every race so far this year in them. They are a minimalist shoe, which means they have less cushioning in them than traditional running shoes. Their drawback? After only 150 miles, the bottom tread has worn down considerably. Typically, running shoes should last you between 300-500 miles. I still run in them for now for distances between 3 and 6 miles. These were my second choice when I bought my Skechers. I read somewhere that your shoes would last longer if you alternated pairs, so I bought these in May right after the Kinvara 4s came out, so the 3s were put on sale. However, they have a very narrow toebox and come up higher on my heel, so they give me blisters on longer runs. Now, let me just say, that I’ve got narrow-to-normal width feet, so this is not an issue of my foot being wide. I’ve remedied two of the three blisters I get by wearing Injinji toe socks (you can see them in the photos below): I get the mini-crew length so the shoes don’t rub my heel and the separate toes eliminates the blister I get on the inside I get of my left big toe. I still haven’t figured out how to stop from getting a blister on the outside balls of my feet, just due to the toebox being so narrow. They also aren’t as breathable as my Skechers, so my feet get hot in them (also might be due to the narrowness, since feet swell when you run, so they might just be closing off the air path). If I could exchange them, I would go up half a size; I think that would make a huge difference. I typically use these on shorter runs under 3 miles to keep the blisters down. 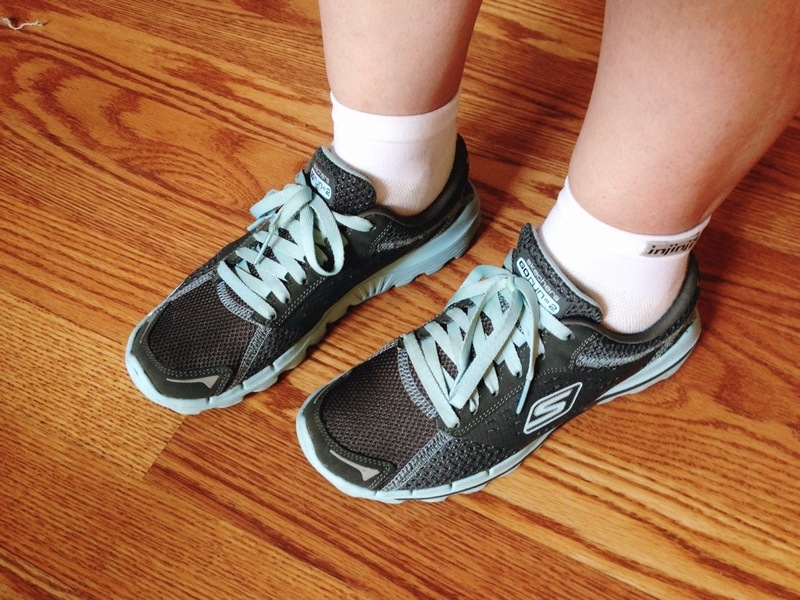 As a minimalist shoe, you can see how much flexibility the Skechers have in them than the other pairs. Also, I love my Injinji socks. If anyone needs any gift ideas for me, I will happily take more pairs of them (especially in fun colors! ), since I only have the one. 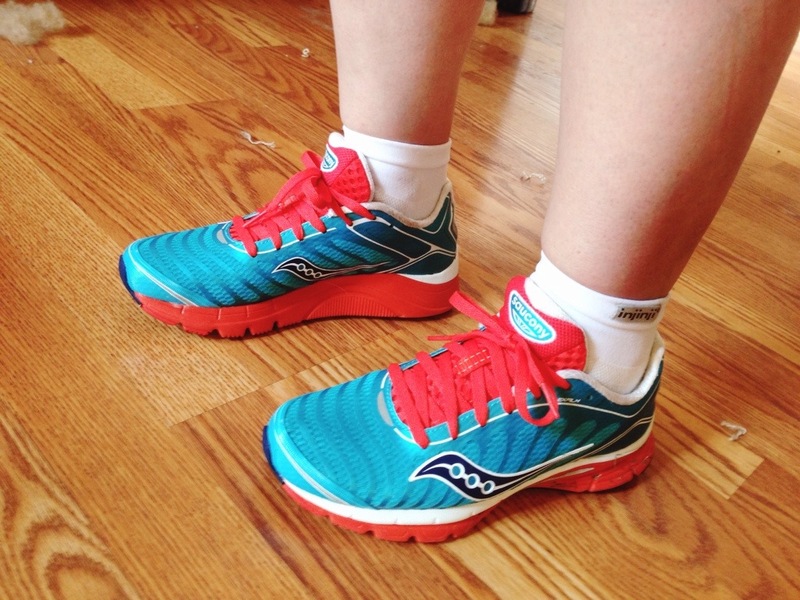 How long did it take for you to find the perfect running shoe? This entry was posted in Gear and tagged pearl izumi road n2, saucony kinvara 3, shoes, skechers gorun 2. Bookmark the permalink. You know, guys like shoes too. I hate to admit it, I own more than I should. However, now that I have identified the minimalist shoe that best suits me I have way less shoes than before. Although, I could use a few new pairs….oh and these don’t count my boots. Great reviews! Although I can’t bring myself to believe that Sketchers could make a good minimalist shoe. 4mm is still a lot. This is more like a “transition” shoe to me. I tried on the Wave Riders and really liked them! My friend Amanda ended up getting them and loves them so far. I also tried on the Mizuno Wave Elixir, which were a little lighter. I’ve heard good things about their new Wave Sayonara, though, so I may get those after my Pearl Izumis wear out.